We are in the midst of registering for classes for Fall 2019 at Ball State University, and there are some of us who are unsure of where we want to be next semester. There are unique opportunities here known as immersive learning projects, where students get to experience a hands-on learning environment with the professor as a guide. This semester, Dr. Rai Peterson convinced me to sign up for the Honors Colloquium for Book Arts Collaborative, the immersive learning project she has overseen for three years now. 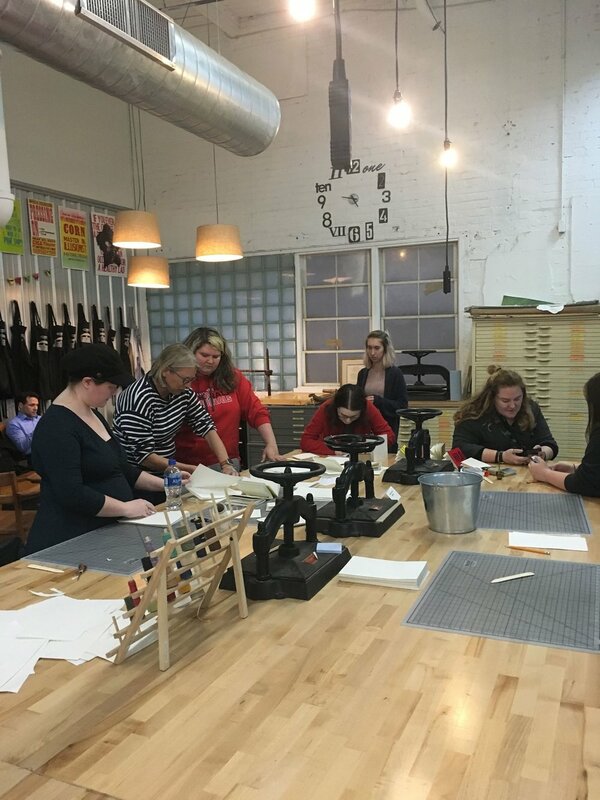 It started, as all great ventures do, with an idea, an idea to preserve the history of hand-sewn bookbinding and printing with moveable type by teaching students how to do it. Now Book Arts Collaborative is a student-run business with Dr. Peterson acting like a CEO/advisor for us. As a result, there are many opportunities to take on leadership roles as managers in the shop. There are people who take care of the shop that we rent in Madjax Maker Force, manage our online presence, communicate with the retailers who sell our products, and come up with ideas for new products. The management teams are ever-evolving, and Dr. Peterson is always open to hear new ideas on how to divide up our responsibilities. One of the best things about Book Arts Collaborative is that students get to start learning from day one. I went into the shop on my first day and Marie Drascic, the current communications manager, pulled me in and introduced me to some of the members of the collaborative before helping me start a sewing project. Everyone is friendly, nice, and unafraid to help with anything we are working on, whether it is a first book or a series of posters, coasters, or cards. The shop is a relaxing and warm place, and I would spend all of my time there if it weren’t for other classes. If you even have a little bit of interest in this class, I implore you to try it. It was the best decision I made this semester and I will be coming back in the fall. If you want to learn more, please email Dr. Peterson at rai@bsu.edu, or come visit us down at Madjax in downtown Muncie! All of us would be happy to see you, answer your questions, and show you what we’re working on. This piece was written by a Ball State University student and member of the Book Arts Collaborative in Muncie, Indiana. The Book Arts Collaborative is dedicated to preserving and promoting the apprentice-taught skills of letterpress printing and book binding through community interaction. It's not just what we make that matters, but how we learn from one another to make it happen.